Emma and Lamar are an Amish couple that have recently married and moved to Sarasota, Florida for the winter. Emma decides to have a quilting class in her new home. 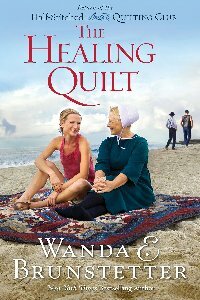 The Healing Quilt by Wanda E. Brunstetter was a delightful story and it makes me want to go back and read the earlier books in the series. Emma and Lamar Miller, an Amish couple, have recently married and moved to Sarasota, Florida for the winter. Emma misses teaching quilting classes so she decides to hold a class in her new home. It seems that individuals that are hurting or have some other problem, gravitate toward Emma and her quilting classes. Jennifer, Phyllis, Erika, Kim, Noreen, and BJ sign up for the class and during the six weeks, Emma works her magic which is not really magic but just good common sense and a devout belief in God. The author did an excellent job in the development of all aspects of the book. Everyone of the characters came to life on the pages of the book and the dialogue of each was very believable. All the scenes were so vividly described that I felt myself right in the center of all the action. Each individual that had a problem at the beginning of the class seemed to work through their feelings and situations and ended with happy results. It was actually inspiring to read about Emma and Lamar’s life and how they helped everyone that came in contact with the couple. I recommend this book to all that enjoy a good story about the Amish. Deanna Love Gottreu is a 75 year old widow and the mother of two wonderful sons who share second place in her life – with God being in first place. She spends her time reading or making quilts for charity. Her book reviews can also be read on her blog at www.buzzardsroostcrafts.com/blog. Five years ago, Tristan Scott spent the last day of summer vacation with Brie as they went for a midnight swim in the lake. He has not seen Brie since then and has no idea that they have a son. To Swim At Midnight by Suzanne D. Williams is a Christian love story but with a somewhat different plot than most Christian novels. Tristan Scott has returned to the lake where he spent the best summer of his life. His father has died and Tristan has to sell the lake house to pay the debts left by his father. He does not want to sell the house for it is filled with memories that he can’t forget and the best memory is Brie Angler. She and he shared a midnight swim that he will never forget. It has been five years since he has seen Brie but in driving by the house where Brie lived, he sees her in the yard and all the memories come rushing back. When Tristan stops to talk with Brie, he gets the shock of his life when he sees a very young boy who looks exactly like him. Tristan is at the lake house with his current girlfriend and she is not happy with the way he is acting for of course she has learned about Brie. Suzanne has done it again with another great story. This Christian story is different for the main character does not become a Christian in the story. However, the reader is left with the feeling that he will become a Christian for Brie is now a Christian and is rearing their son with Christian values. The characters were so well developed that I was feeling each of their emotions right along with them. The dialogue of all the characters seemed to be exactly what would have been said in all the situations. I was pulling for Tristan and Brie to get together but I did feel a little sorry for the girlfriend. The author did have her speak her mind but she was not cruel as she could have been. There was some suspense in the plot line for I did not know if Tristan would marry the girlfriend or if he would end up with Brie. This story definitely showed the power of love and how it can change circumstances. The story had a good ending and I would like to see a sequel. I definitely recommend this book even though it is not your typical Christian romance. This book was provided by the author as a review copy. Serena Gray works as an emergency nurse and when she receives a letter stating that her husband has a daughter that he never knew, her life is filled with unanswered questions. 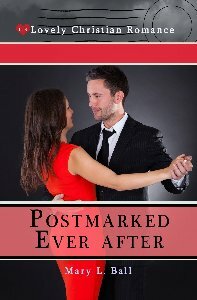 Postmarked Ever After by Mary L. Ball is a very good Christian romance that leaves you with a good feeling when the story is finished. Serena Gray works as an emergency room nurse and is beginning to move on after the death of her husband. A letter addressed to her late husband arrives and it is from a woman dying of cancer telling him that he has a daughter he never knew. Through a chance meeting, Serena meets Adam Knox who just happens to be the husband of the woman who wrote the letter. Serena gives a talk on nursing at the school where Adam is the principal and one of the students at the lecture is Nicky, Adam’s daughter. Serena is sure that Nicky is her husband’s daughter and the story gets very interesting at this point. Should Serena show the letter to Adam or should she just remain quiet? Is there really an attraction between Adam and Serena? Mary Ball did an excellent job in the development of this story. The characters came to life on the pages of the book and I actually felt as if Serena, Adam, and Nicky were close friends. It was good to have a pre-teen portrayed in such a loving and sweet way and the dialogue between Nicky and the adults was a joy to read. Scenes were so well described that I could see myself right in the middle of everything that was happening. Actually I was more standing in the background urging Serena to show the letter to Adam for I was sure that he knew that Nicky was not his biological daughter. The suspense throughout the story dealt mainly with Serena and the letter. Would she give Adam the letter or destroy it? Another little surprise was the dream of a young boy in the hospital and when he told Serena about the dream, she was not sure what to make of the dream. When the three main characters finally worked though all their problems, the story had a wonderful ending. I highly recommend this book to anyone that loves a great love story with a Christian message. Lauren, Bethanne, and Linda are friends and all are having problems in their relationships and/or businesses. 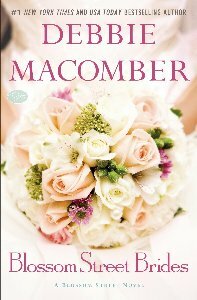 Blossom Street Brides by Debbie Macomber is an inspiring story about three women and the problems in their lives. Lauren Elliott is dismayed when she learns that her younger sister is pregnant. Lauren has been waiting for years for Todd to propose. After deciding to take matters into her own hands, she meets a man named Rooster. Bethanne Scranton is a newlywed but she lives in Seattle and Max lives in California. Neither feels that they can move because of their businesses but the miles between them are beginning to cause problems. Linda Goetz is very happy with her husband Brad but she is deeply troubled about the future of her yarn shop for business has dropped off. The business is given a boost when someone starts leaving baskets all over town with instructions to knit a scarf for charity and to buy their yarn at A Good Yarn. Debbie Macomber did an excellent job with all elements of this story. I felt as if I knew each character personally for they were so well developed. I must say that my favorite character was Rooster. You will have to read the book to learn his real name and why he was called Rooster. I became involved in all the scenes for again Debbie made them so realistic. The story kept me reading when I should have been doing something else because I had to know how each woman would solve her problems. I was not disappointed with any of the solutions. I definitely recommend this book to all who love a good romantic story and enjoy books by Debbie Macomber. Most of the action in this story takes place in Louisiana where the Union and confederates are in a battle to have control of the Red River. 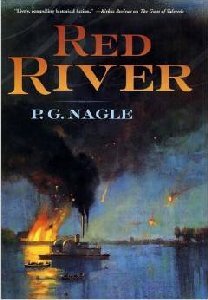 Red River by P. G. Nagle is a well written book but I found it somewhat hard to really get into the story because there were so many Generals, Colonels, Lieutenants, Captains, Sergeants, and Privates for both the South and the North that I had trouble keeping them straight. In fact, I gave up and just focused on the story line that involved Marie Hawkland, mistress of a large plantation, Nat Wheat, a Union Navy carpenter, and Jamie Russell, a Confederate Captain. The story features battles that took place on the Red River in Louisiana where it flows into the Mississippi River. This was the largest waterway in the country and both the North and South wanted control. A good bit of action takes place at Marie’s plantation for she was more or less friendly with both the South and the North. The Confederates wanted to buy cotton to exchange for weapons and the Federals wanted to buy cotton just to keep it from the Confederates. The battle scenes were quite graphic and in my mind I could see all the horrors of the battles. I could not keep all the battles straight but the friendships between the men, both Confederate and Federal, made for enjoyable reading. There was a great deal of suspense in the story for I never knew which side would win the battle. I enjoyed the twists and turns in the plot line concerning the individuals for there was lots of suspense wondering how each of the main characters would end up. At least for me the story had a happy ending. I recommend this book if you are really into stories about the battles fought in the Civil War and don’t mind profanity in the story. Jake Miller is an apprentice blacksmith and he also has a unique way of handling horses. Priscilla Kinsinger has returned to Lancaster after six years and to Jake’s dismay, she also has a way with horses. 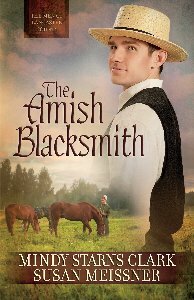 The Amish Blacksmith by Mindy Starns Clark & Susan Meissner is a delightful Amish novel that was a joy to read. Jake Miller is an apprentice blacksmith and he also has a way with horses. Priscilla Kinsinger has returned to Lancaster after being away for six years. Priscilla also has a way with horses but Jake is very skeptical of her ability. Jake is interested in courting Amanda Shetler and is quite upset when his boss, Priscilla’s uncle, asks him to help Priscilla become a part of the community again. Amanda thinks it is a great idea and immediately starts to play matchmaker and Jake unexpectedly begins to find himself drawn to Priscilla. The authors developed the characters so well that I felt that I personally knew everyone and they all came to life on the pages of the book. When they were describing the work that Jake and Priscilla were doing with the horses, I was right there with them urging them on. The way the authors had Jake helping Priscilla to realize that her mother’s death was not her fault was very touching and even brought tears to my eyes. Amanda provided several laughs due to her working so hard to be a matchmaker. The unanswered questions surrounding the death of Priscilla’s mother were finally answered. The other question to be answered was would Jake choose Amanda or Priscilla? If you are a lover of Amish fiction then you definitely want to read this book. Lyric Bolton and her younger sister Lark live with their mother but are shunned by everyone in the community because of the mental illness of the mother. 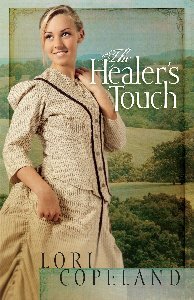 The Healer’s Touch by Lori Copeland is a great story of love and faith in God and also provides a lot of great laughs. Lyric Bolton and her younger sister Lark live with their mother but are shunned by everyone in the community because of the mental illness of the mother. Lyric has convinced herself that she will always be alone but then Ian Cawley comes into her life in a very unexpected and funny way. The characters, dialogue, and scenes were all very well developed by the author. All the characters came to life on the pages of the book but Lyric and Ian were especially real and I was pulling for them to work out all their problems. Scenes were so vivid that I was holding my breath during some of them and laughing like crazy at other happenings. And then when the author added in the “spook” lights that frightened nearly everyone in the community except Lyric and Ian, you have more good laughs and also some suspense. The note left by the dying mother was quite a surprise but cleared up a lot of things. I liked the way that the author combined scripture into the story and that she had Lyric and Ian remaining firm in their Christian beliefs. I highly recommend this book to all that enjoy a great historical novel with lots of romance, suspense and a good laugh or two. Fictional story based on the real life adventures of Sara Emma Edmonds who served in the Civil War for two years as Private Frank Thompson. 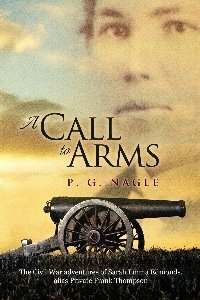 A Call to Arms by P. G. Nagle is fiction but based on the real life adventures of Sarah Emma Edmonds who served in the Civil War for two years as Private Frank Thompson. Sarah grew up on a farm with a father who wanted a son, therefore, she could ride and shoot as well as any man. Since she had a strong feeling of patriotism, she joined the 2nd Michigan Volunteers. In the army she worked as a nurse, a spy, and other non-combat jobs. Her greatest fear was that she would be exposed as a woman for this would have lead to a court-martial and disgrace. The story began many years after the war had ended when Sarah was in Washington seeking her pension. The characters were well developed and they all came to life on the pages of the book. I could feel Sarah’s worry as she had to always be on guard that she did nothing to reveal that she was a woman. The battle scenes were very realistic and I was anxious to know the outcome of each battle. For me it seemed that the only mystery was if Sarah would be found out. We all know how the war ended so there was nothing to anticipate there. The author did a good job of switching between the years of the war and to the events happening in Washington twenty years after the war ended. II recommend this book but be aware that there is some profanity. Madeline Howard worked for one day as a nurse in a Union hospital and during that short time she saved the life of a Confederate soldier, Colonel Haywood. 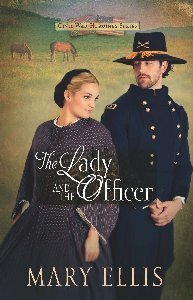 The Lady and the Officer by Mary Ellis was a very enjoyable historical romance novel that takes place during the Civil War. Madeline Howard served one day as a nurse after the battle of Gettysburg but in that short time she saved the life of Elliot Hayward, a Confederate Colonel. Madeline’s home was destroyed so she left Pennsylvania and moved to Virginia to live with her only relatives. She was living in the South because of necessity but her heart belonged to the North and especially to General James Downing, a soldier in the Union Army. Colonel Haywood never forgot Madeline and when he happened to meet her in Richmond, he tried everything to win her affection. Mary Ellis did a great job in the development of the characters, dialogue, and scenes. All the characters simply came to life on the pages of the book. They were so well presented that I felt as if I knew them all personally. Scenes were vividly described that I felt myself taking part in all the things that were happening. There were many twists and turns to the plot line and they all added to the suspense of the story. Which man would Madeline choose? Would she be captured as a spy? Would she be able to return to her hometown in Pennsylvania? And, why was Madeline a nurse for only one day? The ending of the story was very satisfactory. I definitely recommend this book to anyone that really likes an historical romance that is set in the period of the Civil War and also includes several battles between the North and South. Agatha Watson is an investigative reporter for the New York Tribune and is now in Colorado hoping to outwit someone in New York who wants her dead. 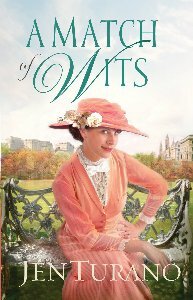 A Match of Wits by Jen Turano is a most delightful story that had me laughing out loud several times in each chapter. Agatha Watson is an investigative reporter for the New York Tribune and is now in Colorado hoping to outwit someone in New York who wants her dead. To Agatha’s dismay, the newspaper has provided her with a bodyguard and she tries daily to shake him and go off on her own. Her dear friend, Zayne Beckett, is also in Colorado but neither of them wants to run into the other. Agatha does run into Zayne in a saloon where he is drunk and looks as if he has not bathed, shaved, or washed his clothes in months. She know that she is the one that must get him back home to New York and his family. Zayne does not want to go home but Agatha insists and when they arrive in New York after many trying situations, he finally realizes that Agatha is in real danger. He tries to become her protector but she rejects his efforts and what follows is a royal battle of wills that makes for some exciting moments and sometimes a good laugh. Jan Turano did an excellent job in developing all the characters in this story. They were so well written that they definitely came to life on the pages of the book. They were so realistically portrayed that I was right there beside them in every adventure. The description of the scenes made them come to life and pulled me right into the middle of what was happening. I cannot remember reading any book in which the dialogue gave me so many laughs. And there were many twists and turns to the plot line and these kept me guessing until the end of the book. There was enough suspense to keep me reading when I should have been doing other things. I highly recommend this book to anyone that enjoys an historical novel that is filled with lots of laughs. I also think that men might also enjoy the book.